To provide some insight into the nature of these disagreements, and to suggest a possible solution to the compensation issue, this article undertakes a critical reexamination of the takings jurisprudence. 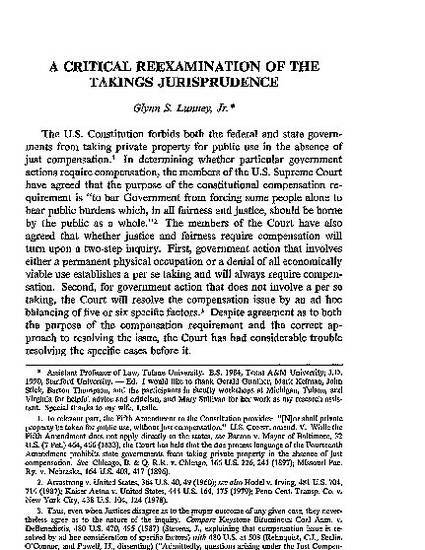 It focuses on the two bases which the modem Court has articulated as support for its resolution of the compensation issue: (1) the articulated purpose of using the just compensation requirement "to bar Government from forcing some people alone to bear public burdens"; and (2) the early case law. Beginning with the Court's first struggles with the compensation issue in the late nineteenth and early twentieth century, this article traces the historical path of the takings jurisprudence, reexamining the early cases and the policy reasons behind a constitutional requirement of compensation. This journey suggests that neither the early case law nor the articulated purpose of the Takings Clause will support the modem Court's resolution of the compensation issue.